SIDN registrars wanting to drop catch deleting Netherlands (.NL) domains can run our software everyday to quickly check and register their chosen names automatically into their registrar account! This drop catching tool has been coded around the EPP and DRS protocols and will run at the maximum possible speeds allowed by the SIDN registry. Clients who purchase this software will receive an additional bonus application which they can install and run as well. Since each of these two programs uses a different protocol for drop catching you will be able to run then simultaneously at the same time. By running two drop catchers at the same time you will be sending more requests per second, increasing your odds of having more success! If you currently have an active registrar account with SIDN then stop waiting and start to discover the big business of expired domains! 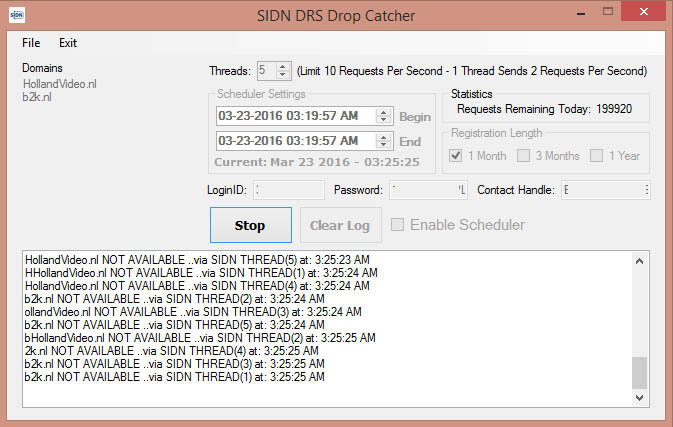 Compete with large backorder companies and individual drop catchers by using the fastest publicly available SIDN drop catcher currently on the market. Your download will be available instantly after purchasing! Need to become a SIDN registrar? Learn how to get started at their website. Note: Registration Keys Are Not Sent Until Payment Has Been Verified.